As mentioned in my last blog post, I have fallen deeply in love with Lake Erie after my husband and I decided to travel around the lake on vacation. 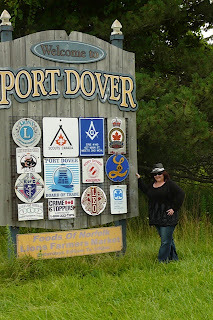 Today, I’d like to talk about Port Dover, Ontario which is located on Lake Erie’s northern coast and was the kicking off point for our trip around the lake. 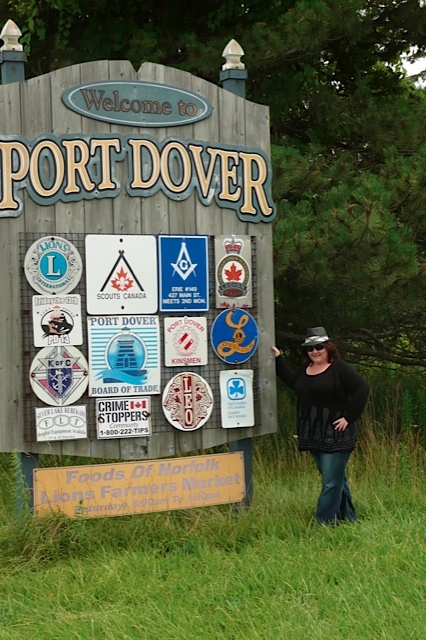 Port Dover is known for great food, good fishing and a fantastic fine-grain sandy beach. It’s a beautiful area, and one we have visited every other year since we met. The farther we drove from Cambridge to the lake the more clouds rolled in. It looked like the rainy forecast was going to become a reality. This made getting food the first order of business when the rain drizzled down. 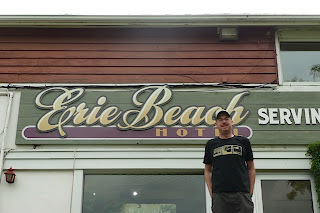 For decades, my family has held the tradition of going to the Erie Beach Hotel to get some Lake Erie perch and celery bread. My parents, grandmother, great aunts and uncles would all congregate there at least once a summer in Port Dover to share a few laughs and delicious food. Even with this long standing tradition, my husband had never had the pleasure of trying out the Erie Beach! Being a rainy day, the beach was quiet and we somehow snagged street parking right out front. Of course I had to take the obligatory picture of my husband with the sign and then it was up the stairs and in. 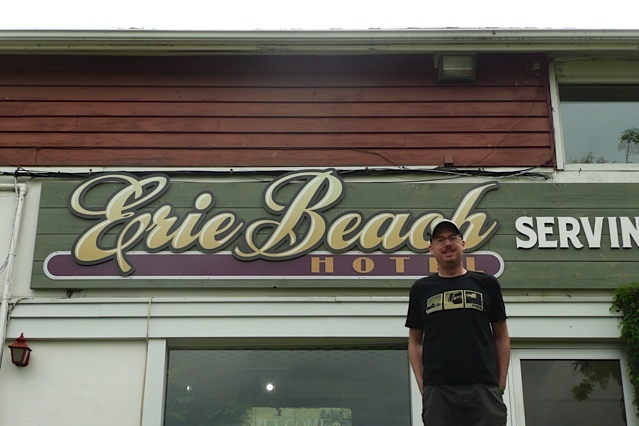 It’s been a few years since I’ve been in the Erie Beach Hotel restaurant and it appears to have undergone updates in recent years. The restaurant is located on the second floor of the hotel which is situated on a hill not far from the beach and docks. Being so high up, it is easy to see over many of the other shops and areas to the water and for us, this meant watching more clouds roll in. We decided to continue watching our calories by splitting a full meal and the kitchen staff was very accomodating. 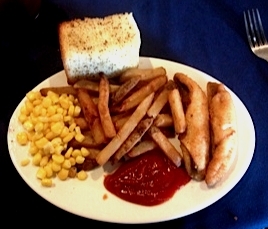 What arrived at our plate was the most deliciously battered perch meal complete with fries, a side of corn and celery bread for two. The celery bread was cut into squares and lightly browned on all edges. There is something to be said about restaurants that haven’t changed their menu in decades. When it’s good, it’s very good and the Erie Beach Hotel in Port Dover did not disappoint! 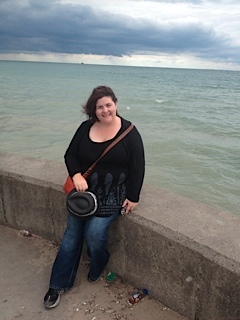 I was itching to get to the shore of Lake Erie after our meal. This was where our #aroundErie journey would begin. This was the moment we were waiting for and hand-in-hand we headed to the beach. It was near deserted but some brave souls were still in their bathing suits despite the cooling temperatures. Clouds began building over the water and fishing and pleasure boats were heading along the front towards the safety of the shore. Beneath the clouds the air was clear and it was possible to make out the opposite shore on the horizon. Seeing the clouds rolling in, our hearts really started pounding as we headed along the break wall toward the lighthouse. The winds picked up and our hats began to fly off. It was very hard holding cameras and hats when the wind had other plans! Leaving the waterfront, we passed many shops and boutiques selling everything from boogie boards and beach wear to wind chimes and a variety of keepsakes and memorabilia. With the chill in the air, and the open road calling us, there was only one other stop that had to be made. My husband needed to get an Arbor Dog. Getting a foot long hot dog from The Arbor has been a tradition in James’ family for as long as he could remember and he couldn’t survive this trip without one. The Arbor is located at the corner of Main and Walker, which is the first turning point to get to the beach from downtown Port Dover. Not only do they proudly serve Schneider’s foot long hot dogs, They have a variety of condiments, and an orange drink called the “Golden Glow” that has helped make them famous. It’s probably safe to say that The Arbor is the main reason our fridge is always stocked with a variety of sauces, relishes and mustards at all times. James was pretty stoked that the last place we stopped was the Arbor and with his hands full of delicious hot dog, I took the wheel and we hit the road for our next #aroundErie destination, happy and ready for adventure.